I finished this book three days ago, yet I still find my mind wandering over hills and streets in Afghanistan that I have never seen with my eyes. A Thousand Splendid Suns is a gripping tale of female heroism set against the backdrop of war-stricken, Taliban-ruling Afghanistan. It is a tale that brings to light the grimy details of war and female oppression, but most importantly, one that illuminates the strength and endurance of the human spirit. Hosseini seamlessly weaves together the first-person narratives of two female characters, Mariam and Laila, whose lives inadvertently intersect in a world that seeks to divide. They form a bond, this unlikely pair, as strong as mother and daughter, one that is underlined by relentless fear and abuse. As a woman, I couldn’t help but reflect on the phrase… It’s a man’s world. The sufferings of Mariam and Laila swelled that phrase into a whole new meaning for me, transforming it into a real face with very ugly features. This book may be a work of fiction, but the injustices faced by women in Afghanistan and many other places around the globe—in our modern era—are anything but. The narrative moves quickly with its fluid, straight-to-the-point prose and a pace that never misses a beat. The details Hosseini provides are carefully selected, never overly descriptive or sympathetic, transporting us to an unfamiliar world that ends up feeling rather familiar. In the end, when the stage is stripped away and all the costumes are hung up, we find that no matter where our place in the world, pain is pain, need is need, and love is love. With this book, Hosseini has painted a beautiful and heartbreaking portrait of life behind an Afghani woman’s burqa veil, all within the intriguing context of Afghanistan’s turbulent history, changing seasons, and various landscapes. This is not a simple tale of hardship and triumph. It is one of love, endurance, hope, and forgiveness. 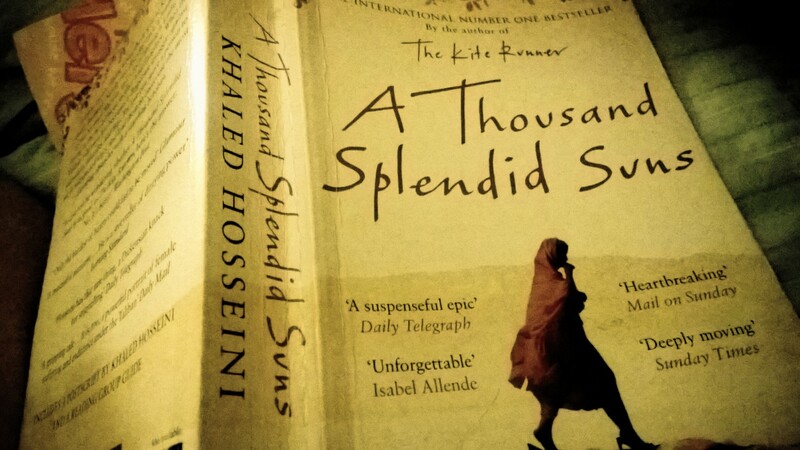 In Khaled Hosseini’s A Thousand Splendid Suns, the power of love in an anguished world truly shines. Have you read this book? I’d love to hear what you think! When the book first came out, I was somewhat reluctant to read it simply because I had anticipated the subject matter, and envisioned disturbing images of female abuse and oppression. Topics which greatly disturb me. However, after reading many great reviews, and coupled with curiosity, I decided to read the book. I could not stop reading it. The book engaged me as an active reader. I felt pain, empathy, I cheered, I jumped, I cried, I reflected. This book truly captures the fight for survival of the human spirit. It is a reminder about a human being’s inner strength, compassion, and love that carries us through our own personal battles in life. And most importantly, to remind us and help us appreciate the power of freedom.